For those of us looking for evidence that consciousness continues in some way beyond the point of death, then this new book by Josie Varga will provide much foor for thought. 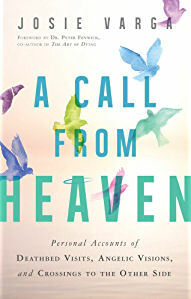 Although most of the accounts of deathbed visitations, visions of angels and near-death experiences during the end stage of life are anecdotal (and, by definition, mostly offered from the point of view of the witnesses in the room with the dying person), taken together they form a reasonably compelling corpus of testimony. Indeed, the author makes a passionate plea towards the end of the book for Science to pay more attention to these events, which, when they occur, can have such a profound effect upon both the experiencer, and those who witness them. Of course, Science (and particularly Medical Science) has a habit of labelling all such events as 'hallucinations'. And while they might be profound to those experiencing them, as with all paranormal or supernatural phenomena, they are dismissed as being bizarre artifacts of the mind - particularly one which is experiencing altered states of consciousness due to extreme conditions within the living system. But then why are so many of the deathbed visitors themselves deceased? If these are simple hallucinations by a delirious mind, then why are the visitors not more randomised? Or is it that this might also be going on, but lack sufficient profundity to be reported upon, skewing the figures? Also, where the dying person's mental state is often delirious, partly as a result of palliative care drugs, these events have a hallmark of marked lucidity which seems, at that moment, to clear away the fog of delirium. To sideline the evidence without looking at this in a bit more detail is to miss important details which should make even the most sceptical scientific mind stop and wonder. The only hurdle left unclimbed, as far as I can see, is a lack of predictive quality to this. Not everyone transitioning seems to experience deathbed visitations by deceased relatives (and sometimes by those the incumbent had no idea were already dead - these so-called 'Peak in Darien' cases have a long, documented history (pp52-55)). Not everyone in that state, just before the end, seems to get that second wind which animates them beyond the natural boundary conditions imposed by their terminal illness. Science would seek to universalise the experience in order to validate it. One of the reasons to take this more seriously than other paranormal phenomena is that the very fact that these occurrences take place near the point of death lends them validity. They fall into the same category as death-bed confessions. Why would the dying person lie, fabricate, pretend? There is no conceivable reason to not believe that what they're reporting at that point is not exactly what they are experiencing. In which case, the experience for them is real enough. It is then up to us to unpick it, and try to make sense of it. Josie Varga makes an excellent job of this within the pages of this fine book. But her focus is not just the science, but also the person at the centre of this phenomena, and their grieving relatives. Her writing is sensitive to the needs of readers looking for comfort in a book such as this, as well as, at times, profound and moving. The author also asks searching, logical questions, using clear analogies to make her point. Her curiosity is ever present, and she brings in contributions from many other authors, researchers, doctors and nurses who, themselves, come to question medical science's reliance upon a purely physical model to explain the body and mind, mot of whom were women. Many of these examples and insights into near-death experiences in palliative care came from researchers with PhDs exhibiting strong academic backgrounds. I was particularly impressed by the wisdom of Michael Barbato about the dying process, and what experiences like deathbed visions can teach us. As a registered nurse myself, who has been present during these transitions often enough, I too have sometimes encountered strange events and experiences. Not all of the time, of course, but often enough to make me wonder. I often thought of readings and research I made into Buddhism when such events happened, and was ever mindful of what might be going on around me unseen. I would have liked to have seen Josie Vargo apply some of this to her analysis, like the Bardo Thodol, for instance. Perhaps it might have become too dark a journey for such a positive book. The initial heavenly light experienced by the dying often transforms into other experiences, the Buddhist Masters teach us. All part and parcel of the road to reincarnation. The author opens the book up to other possibilities, to explain the events documented within its pages. Is consciousness more like a field state than just a collection of firing neurones (p35)? Might the brain be acting as a filter within such a universal field (p30) which, when failing close to the point of death, opens up to reveal a greater realm of experience than it would normally allow? How else might one explain visions experienced by blind people, for instance? Similarly, out-of-body experiences? I was amazed by William Peters' account of a time during his hospice work when he experienced an OOBE, only to encounter the dying person within this alternative state of consciousness nodding their acknowledgement (p121). What on Earth could science make of that? We are instead moving deeper and deeper into mysticism. Other thoughts that crossed my mind on a comparative level were with the ancient traditions of ancestor worship (if so many dying people evidently have visions of departed loved ones turning up to facilitate their transitions, then best to keep the departed ones front and centre in your thoughts, right? ); and also the almost everyday paranormal experiences of physical mediums ("I see dead people"). Again, not touched on within this book, but I could see connections. The book, instead, tended towards a more conventional religious meaning and message. Not because the author was steering it in that direction, but because that was the contextual backdrop for most of the experiencers (who expressed any faith at all). The author made the point that the experiences tended to meet the religious expectations of the experiencer, which is likely true. Scientists might argue that this indicates a subjectivity to the phenomenon which devalue them as authentic events. Or you might argue that such profoundly paradigm-shifting experiences need a certain amount of cultural filtering to make any kind of sense to the viewer. We experience, and we interpret in terms of what works for us. The author then makes the point that dying people don't report the disappointment of experiencing nothing (p160). There is no space for nihilism here. Again, Buddhist would examine the importance of arriving at a state of complete nothingness, leaving the manifestation of visionary experience behind as another trick of non-reality to fool us. Nothingness is not noteworthy, after all. Subtitled "Personal Accounts of Deathbed Visits, Angelic Visions and Crossing to the Other Side"